Mikey, still going strong at 13 years of age, was found as a feral kitten behind the Arizona Equine Surgical and Medical Centre in Gilbert, Ariz. by Dr. Nicole Finch. Finch took him in and made him a sometimes-indoor, sometimes-outdoor pet. Mikey has lived in Arizona, Colorado, Kentucky, and now New York. Finch, one of the Lasix veterinarians working for the New York Racing Association, sought a new placement for Mikey when she thought her fiancé was allergic to cats. It turned out he wasn't – dogs were the real problem, which they only realized after their elderly dog died – but by the time they'd put two and two together, Mikey was a beloved member of the Rice staff. Rice assistant Kris Sankar is tasked with giving Mikey his three (or more) meals per day. Sankar ensures he gets fed at 8 a.m., 11 .a.m., 4 p.m., and sometimes when Sankar starts his day at 4:30 a.m., too. Sankar said Mikey has very exacting specifications and isn't shy about letting the staff know if they're running behind schedule. In return, Mikey is an excellent hunter, catching mice and some rats (particularly favoring young ones in an apparent grassroots effort at pest control). Horses don't frighten him in the slightest, and he has no problem with taking a clawed swipe at a Thoroughbred who rubs their face on him too aggressively. Mikey makes the rounds during bath time, walking around the mats where horses are washed after workouts. Sankar said each horse puts their nose down to acknowledge him. He comes (sometimes) when called by people, usually with his trademark low-throated mew. Mikey's current living arrangement allows Finch to look in on him periodically, checking on his food supply and providing him extra attention. 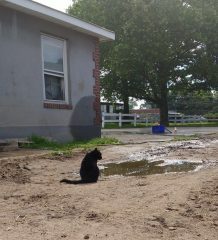 Mikey will likely not join the Rice crew in Saratoga; the barn there is too close to a roadway and Finch and Sankar worry he could get hurt. He will remain at Belmont, where Rice keeps a string throughout the summer, with Sankar and another assistant dedicated to his care. 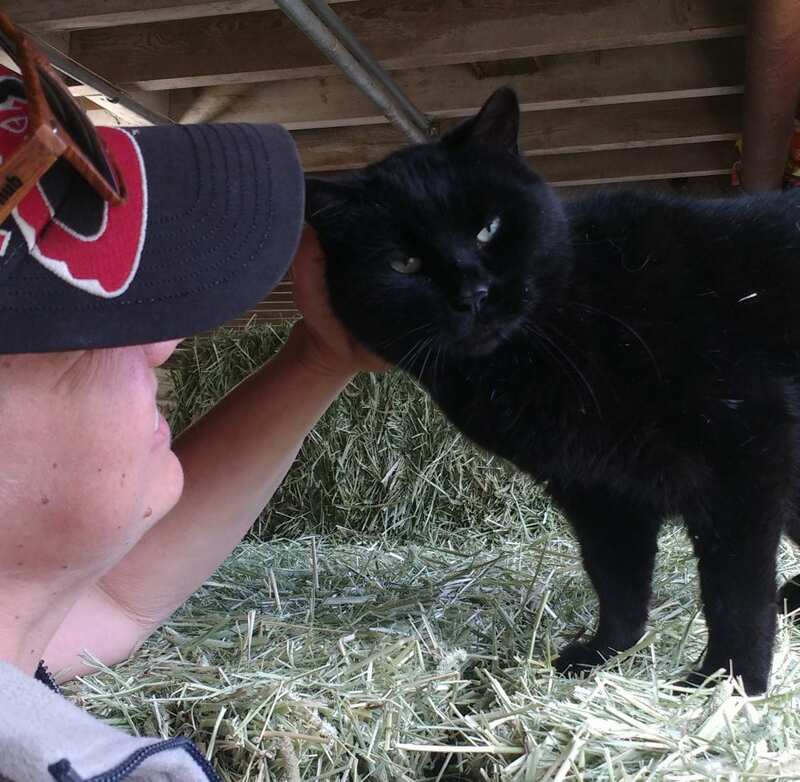 This entry was posted in Barn Buddies, Horse Care, NL List and tagged barn buddies, barn cats, belmont park, dr. nicole finch, Linda Rice, nyra by Natalie Voss. Bookmark the permalink.